Mitt Romney has long avoided explicitly calling President Obama a socialist, but desperate times call for desperate measures—and that includes another dubious ad, this one linking Obama with a triumvirate of famous socialists. "Who supports Barack Obama?" asks the Spanish-language released this week in Florida. 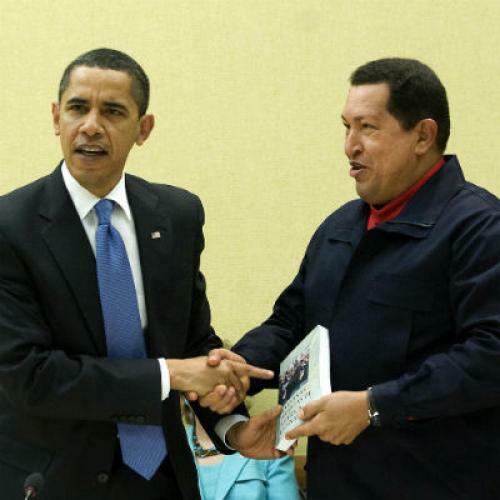 The question is followed by clips of Venezuelan President Hugo Chavez saying he’d vote for Obama if he lived in the U.S. and of Mariela Castro, Fidel Castro’s niece, saying she would vote for Obama, too. It also cites a controversy over an EPA email sent during Hispanic Heritage Month that featured a picture of Che Guevara. The ad is aimed at Cuban and Venezuelan voters, who tend to be more politically conservative than their Hispanic peers. Cubans account for about 70 percent of Miami-Dade’s registered Republican voters and are expected to support Romney over Obama by more than a 3:1 margin, according to Brad Coker of Mason-Dixon Polling & Research, a GOP-leaning firm in Florida. The Venezuelan community doesn't have nearly the same numbers or political muscle—yet. A large wave of mostly upper- and middle-class Venezuelans fled to South Florida in the early 2000’s, after Chavez assumed office, an influx “reminiscent of the Cuban migration spurred by Fidel Castro’s overthrow of Fulgencio Batista in 1959 and his imposition of a socialist state,” the New York Times reported in 2008. Census data show that between 2000 and 2010, the Venezuelan population in South Florida grew by 150 percent, from 41,000 to 102,000. The Romney ad may be targeted at Cubans and Venezuelans—an influential voting bloc and an ascendant one, respectively—but that doesn't mean it lacks wider appeal. After all, just as anti-Castro sentiment isn't limited to the Cuban community, anti-Chavez sentiment can be found among many ethnicities, Hispanic or otherwise. And to conservatives who don't have personal, familial reasons for despising Castro and Chavez, but who do consider Obama a socialist, this ad merely bolsters that belief. Some younger Latinos are rolling their eyes at the ad, but the intended audience is eating it up: the Cuban Republican establishment. The Miami Herald reports Republican U.S. Rep. Mario Diaz-Balart of Miami, speaking on a Spanish-language radio show, praised the ad and cited a proverb that loosely translates to, "Tell me who you walk with, and I'll tell you who you are." * Update: In response, the Obama campaign released the following ad featuring former Miami Mayor Manny Diaz. Diaz was born in Cuba and is an independent.